In his review of the Logitech Ultrathin Keyboard Cover for full-size iPads (rated 4 out of 5), my friend and colleague Dan Frakes described that accessory as making the right compromises for an iPad keyboard case. 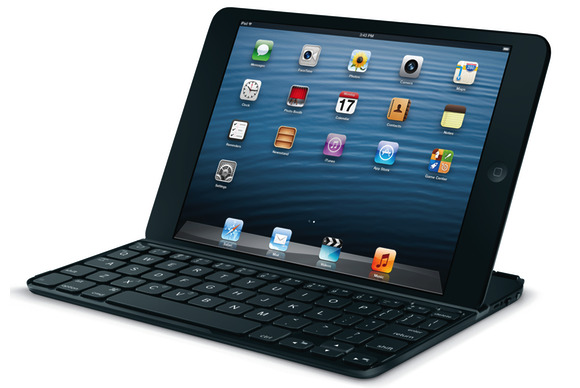 Which, since the debut of the iPad mini, has had many people anxiously awaiting a smaller version. Unfortunately, the iPad mini’s size presents additional challenges when it comes to physical keyboards, and Logitech’s sequel for the iPad mini, the $80 Ultrathin Keyboard mini, makes some of the wrong tradeoffs. The result is a keyboard cover that offers different frustrations than typing with the mini’s onscreen keyboard, but not necessarily less frustration overall. The Ultrathin mini, available with either a white or black keyboard (with a silver or black aluminum bottom, respectively), looks a whole lot like its full-sized sibling, only smaller. A hinge on the back edge attaches magnetically to the left side of the iPad mini, like a Smart Cover. The Ultrathin mini adds just over 7 ounces to your iPad mini’s weight, and the case lives up to its Ultrathin moniker: It’s just 0.3 inches thick, along with 7.9 inches wide and 5.5 inches deep—essentially the same dimensions as the iPad mini itself. The cover closes snugly against the iPad mini’s screen, and a set of magnets opposite the hinge support the iPad’s magnetic sleep/wake feature—an Ultrathin-clad iPad mini looks sleek and professional. As with the full-size Ultrathin, the mini version can’t fold back behind the iPad like a Smart Cover; when you want to use the iPad, you give the keyboard cover a gentle tug to remove it completely, which is a painless procedure. Along the right edge of the Ultrathin mini sit three items of note: a Micro-USB port for charging the keyboard’s built-in battery, a power switch, and a Bluetooth-pairing button. There’s a thin groove, just above the keyboard’s number row and running the width of the keyboard, into which you nestle your landscape-oriented iPad mini when you’re ready to type. Logitech says that you can expect about 180 hours of typing time on a full charge, which is impressive. However, there’s no easy way to determine the keyboard’s current charge level: The LEDs above the top row of keys indicate when the keyboard is charging and when the battery is running low, but I’d prefer a clearer picture of the remaining battery life. I suspect I’ll feel even more strongly about this point after a month or two of use—I’ll likely end up charging the keyboard more frequently than I need to simply because I have no idea how much use time is left. I also wish the included USB-charging cable was a little longer, as its one-foot length limits where you can place the keyboard while charging. Those are minor quibbles. The bigger problem with the Ultrathin mini is that typing on it is simply not a good experience. While fitting a keyboard into a cover with the footprint of an iPad mini means making tradeoffs, Logitech has made compromises that, for this touch-typist, are unacceptable. On the good side, many of the keys on the Ultrathin mini are nearly full-sized—namely, all the letters of the alphabet. The Spacebar is large enough to remain within reach of either thumb. Standard nibs on the F and J keys help keep your fingers in the right places, and I like the feel of the membrane-scissor type keys themselves. To make the keyboard "mini," however, the keys are cramped, and the key layout is frustratingly flawed. There are missing keys, tiny keys, and very tiny keys. As I mentioned, tradeoffs are necessary with compact keyboards, especially when you try to keep the main alphabet keys a manageable size, but I’m not convinced that the tradeoffs on display with the Ultrathin mini are the best ones. For example, a number of standard keys are missing, with their functions only accessible by holding down the Fn key (located in the now-standard position in the lower-left corner) along with other keys: The A key does double-duty as Caps Lock; the Q doubles as Tab. And the Shift keys are small—barely a fraction of an inch wider than the letter keys. The combined effect of tiny Shift keys and missing Caps Lock and Tab keys is an abrupt left edge to the keyboard that, if you’re a touch-typist, makes it difficult to keep your fingers in place as you type: You’ll find that your hand marches steadily to the left as you use your pinky on the (tiny) left Shift key. At least I did. Off-key: Some of the tinier keys, such as Delete and apostrophe—shown here with a pencil for scale—are very difficult to press accurately and consistently. I mentioned that the space between keys is cramped, but the bigger issue is that many of the non-letter keys are too small. Certain punctuation keys (colon/semicolon, apostrophe/quote, and brackets, to name a few), are comically narrow, with the number keys and Delete key barely larger than Tic-Tacs, making them difficult to type and making it far too easy to hit the wrong key instead. (The number keys present less of an issue than the Delete key, which I tended to use a lot with the Ultrathin mini—I found it difficult to press reliably.) And even when I was able to hit these little keys correctly, precisely aiming for the tiny targets often required me to take my fingers off the home row. The result all these drawbacks is that I found typing on the Ultrathin mini to be an exercise in frustration. Which is a shame, considering how good the original Ultrathin keyboard is: I can type 120 words per minute on the original Ultrathin keyboard with great accuracy. My error-ridden speed using the Ultrathin mini was in the low 30s. To its credit, the Ultrathin mini does offer a variety of iPad-specific keyboard shortcuts: There’s a dedicated Home button key in the upper-left corner, along with a slew of Fn-key-activated shortcuts for functions such as Siri, Spotlight, brightness level, and volume. We haven’t yet seen a good iPad mini keyboard case that fits the iPad mini’s footprint: Every vendor whose keyboard matches the size of the tablet has opted for some combination of tiny keys, cramped key spacing, and a non-standard layout. The Ultrathin mini is no exception. (The best ones we’ve seen have opted to make the keyboard larger than the iPad mini itself—the approach taken by Zagg’s ZaggKeys Mini 9.) Though my intent was to write this review using the Ultrathin mini, I couldn’t make it through. The keys are just too cramped, and too many are too small, for me to use it for long-form typing. If you use a hunt-and-peck approach to typing, the tradeoffs inherent to the Ultrathin mini may be worth the payoff of the slim and lightweight approach. And the product’s design and construction are otherwise solid, earning it our 2.5 rating. But if you're a touch-typist like me, I can’t recommend the Ultrathin mini—as much as I understand why Logitech made such tradeoffs, that understanding doesn't help me type with any less frustration.